Get All Those Descendants You Can–preferably not on paper and with some dates and places! Years ago when I started my research, I tried to track down as many descendants of various second and third great grandparents. There was no goal of writing a book or any such thing. I was fortunate enough to find reasonably complete genealogies of the descendants of three different sets of third great-grandparents and I entered that in a database. This was ages ago before I understood the importance of citation and sound genealogy methodology. I was still in high school in the days before the internet and, except for the guidance of a local librarian and copies of Donald Line Jacobus’ Genealogy as Pasttime and Profession and Val Greenwood’s Researcher’s Guide to American Genealogy, I was pretty much on my own. And while there are probably errors in some of the information I have on those descendants of many of my second and third great-grandparents, I’m glad that I have it. It has been invaluable in sorting through my DNA matches. 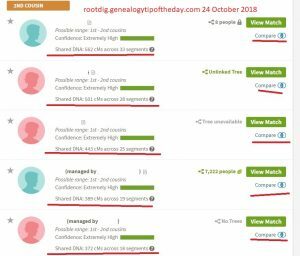 Like many users of AncestryDNA and other autosomal DNA testing sites, I’ve been frustrated and challenged by the number of submitters who have no trees,very short trees, or private trees that remain unlocked. I understand the reasons behind this and have accepted it. 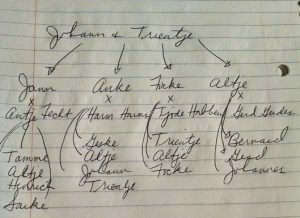 Working through some of the short trees (with perhaps only parents and a grandparent or two) has been greatly facilitated by my database of descendants of many of my second and third great-grandparents combined with the knowledge I have of some families that is in my head and not in my database. Documenting those descendants (as best you can) is a great idea for while you are waiting for your DNA test results to come back–or even if you are stymied with your test results and work with your matches. There is no guarantee it will solve every match, but such a database (even an incomplete one) can greatly facilitate your work with your matches. Get more ideas on what to do before your test results come back in my recent webinar. My G-G-grandfather had 2 wives, 14 children and 1 step child. The youngest child, when in his 80’s compiled a listing of his brothers and sisters, their spouses and children, and many of their grandchildren. I received a copy of this wonderful document when I first began researching that side of the family. There may be a few names and dates off, but it is otherwise pretty accurate. What a treasure! Wonderful to get something like that. Even if it has a few minor errors, it’s always a great help to have something of that type.